Hi Everyone! I hope you all had a great start to the new school year! I can't believe how fast September flew by! It's a new year and that means trying new things with my students! I have used the Picture Exchange Communication System (PECS) for years in my classroom with success, however, my students always seem to get stuck on making sentences that start with "I want" and struggled with going beyond that. 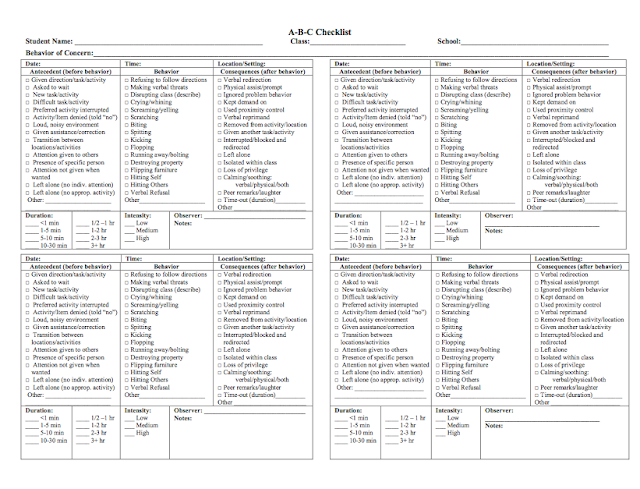 Last year I attended a teacher led conference where I met a teacher who did a research project on using core vocabulary and core boards in her classroom. The results of her study blew me away! She reported higher levels of communication, socialization and reading rates in her students. When I got back from the conference, I met with my SLP and discussed this approach with her. As it was close the end of the school year, we decided to start using this new approach this school year. As I knew next to nothing about teaching core words to my students, I started this journey by doing some research. My SLP gave me the Pixon Project Manual which was a great starting point. This manual helped me to develop an understanding of who to set up the core boards, start teaching and gave me a scope and sequence of words to teach. I also did my own research and found a few great websites. 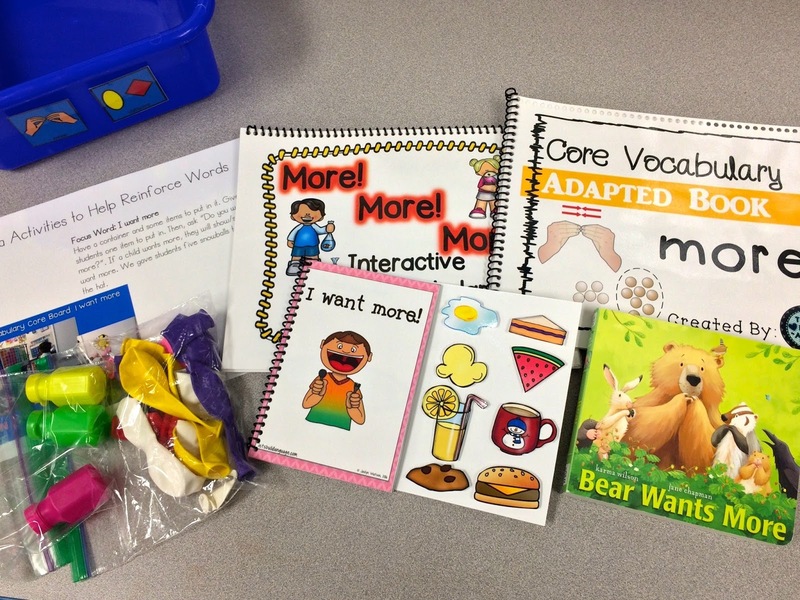 This blog post from PrAACtical AAC is a good description of what core vocabulary words are and how to start teaching them. The AssistiveWare Core Word Classroom is an excellent website with a great handout and video that explain what core words are and how to get started with them in your classroom. After doing some research, it was time to do some lesson planning. The Pixon Project Manual provides a good sequence of words to teach, but for my students I needed to pick and choose which words to teach them. Some of the words are too abstract for my students right now and we wanted to focus on some really important ones that they would use frequently throughout the day, every day. After looking at the materials on the AssistiveWare site, I decided to do a "word of the week" to introduce my students to using core words. Some of my students are learning to use the core words on core boards while others are using iPads with Prologue 2 Go. Core words should be taught across the day and across activities, but I also like to do a whole class lesson to introduce new words. The AssistiveWare site makes planning these easy! They have word of the week (WOW) planners which are basically lesson plans on how to teach the target word. 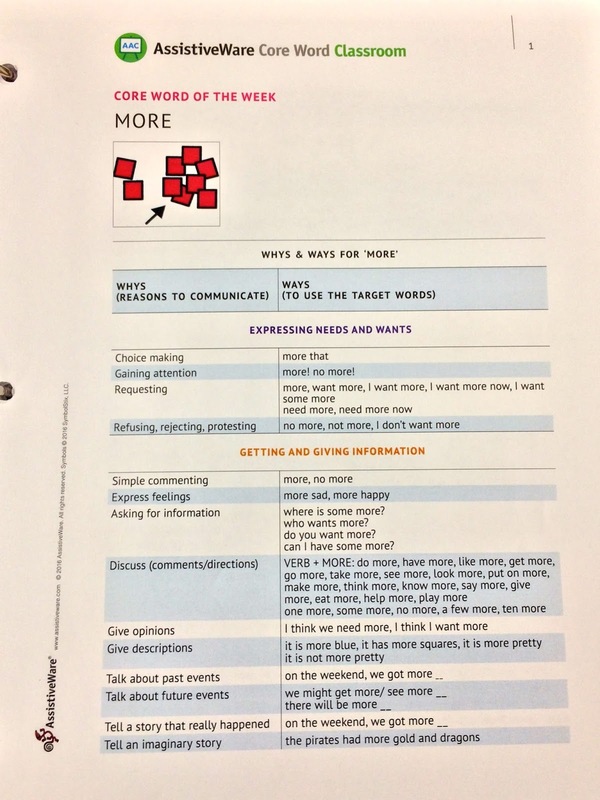 These planners outline the "whys and ways" the core words are used in language, provide a list of ideas for teaching the words, and include a list of books that use the target word repeatedly in the story. The site also has information on how to use core words in your classroom across the day and activities such as morning meeting, life skills, and leisure time. There is also a section called "Five Minute Fillers" which contains ideas of core words to teach during different leisure activities such as card games, playing with toys and songs. After reading through the WOW planners, I started to gather materials we would use to teach the core words during our whole class lessons, small group and one-on-one teaching times throughout the day. Because I am an organizational freak and like to make things easier for my EAs, I set up a storage shelf with bins for each of our core words of the week. The shelf is centrally located in the classroom and it's easy to grab the bin and use the contents to work on core words any time of the day! I started gathering materials by going through our classroom library and finding books that contained the targeted core words. Because the core words are mostly the same as the sight words I teach to my students, I started looking at those ones first. Then I moved on to our library of storybooks and was able to find a few more, but not as many as I wanted, so I hit the thrift stores and was able to find a lot more for very little money! I also like to have interactive/adapted books to use with my students, so I searched Teachers Pay Teachers (TPT) to find those. Teach Love Autism has a really affordable bundle of simple books, and I also like these ones from Tech 'n Talk SLPs, and these from Jaclyn Watson. While I was searching through the TPT site, I found this bundle of ideas and activities from Fun in ESCE which I love! 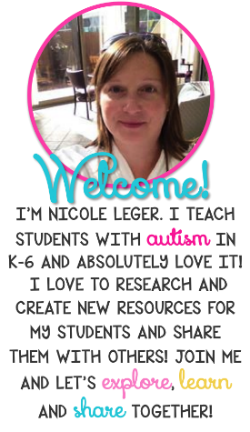 She has tons of great ideas and printable activities to get your students using core words. So, I prepped those and into the bins they went! I then went around my classroom and gathered different toys that I thought we could use for each core word. "simply stated, talk AAC and keep talking AAC. Highlight key words from your natural speech with the AAC picture symbols. The more you use ALI, the easier it gets because you learn where all the vocabulary is located, you automatically slow down, you learn what core word vocabulary needs to be added to the communication display. Learners get to see/hear the language that they are expected to use which makes it more likely they will ‘talk’ back in the language that is spoken to them. By using ALI, you are also forming an AAC visual language environment which helps with comprehension and organization of a language system." Simply put, model, model, model! This is the most effective teaching strategy for core words. The more you model and speak to your students using their core boards or Prologue 2 Go, the more they will speak back to you using these AAC systems. This is why I have core boards posted around my classroom in each and every area. During every activity of the day, staff have a core board with them that they use to speak to the students and I can already see the benefits of this in my students. Whatever AAC system your students use, they should also be using it at home and in the community. When we switched to using core boards, my SLP and I met with each of my students' parents and explained the system to them, modelled how to use it and gave them a core board to take home with them. When working on communication skills, it is so important to have your students' parents on board and working on this as well. That is why I decided to give my students core word homework this year. I have tried different styles of homework over the years and have had little success with parents actually completing it. But, because every single one of my students' parents listed communication as their number one goal for their children, I am hopeful that they will respond positively to this homework system. I found these parent handouts from the Pedi Speechie which coordinate perfectly with the core words I am focusing on in the classroom. I also like that I can check off which level each student is working at: single word, short phrase, or sentence. They provide some great ideas on how parents can teach these words at home and in the community. I also found this homework packet from The Language Ladies SLP which I like because it's sort of an accountability check for parents. I am sending one of these home per week and asking them to be returned on Mondays. That way I can see how often they are practicing the words with their children and then problem solve with them when we have our monthly meetings. Do you use core words in your classroom? I'd love to hear how you teach them! I am always looking for new ideas and activities! Thanks for stopping by! When teaching students who are on alternative curriculums such as the HELP, it is important to track and monitor their progress. The most effective way to do this is by collecting data. Data should drive all the decisions we make. Data is used to determine if a goal is mastered, when to switch or add new targets or when to change teaching procedures to make greater progress. This information is collected and then reflected onto graphs. Graphs are visual tools we use to assess where our target behavior has been, where it is now, and where we can project it to go. Data can be collected on many different behaviors. These behaviors can include behaviors we want to decrease (aggression, screaming, tantrums, pinching, self-injurious behavior, etc.) or behaviors we want to increase (requesting for information, learning to read, counting, etc.). It is important to collect and analyze data to measure student progress, evaluate the effectiveness of the student's individual program, and to identify skills and/or behaviors that need to be taught. There are a variety of data collection methods such as probe data, time sampling recording procedures, task analysis data, and trial by trial data that yield reliable, accurate, and valid data. While the data is important, it must never interfere with our teaching. 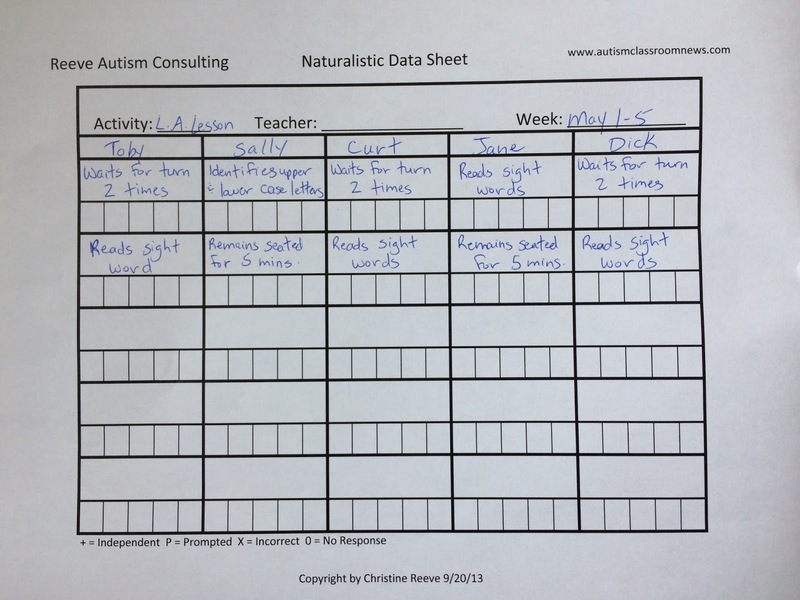 There a few ways data can be collected to track a student’s progress with their IEP goals. One method of data collection is called trial-by-trial data, where data is collected for every presentation of the skill. Data can also be collected as single-probe data, where the data is collected on the first presentation of the day. Both single-probe and trial-by-trial data are typically collected with a plus (+) or independent (I) for a correct response and a minus (-) or prompted (P) for incorrect responses. Task analysis data is used for skills that involve a sequence of steps such as washing hands or doing laundry. Data is taken on each step in the sequence, allowing you to see which step the student can complete independently and which step(s) the student needs to be taught through prompting. Data can also be collected using tallies, which is mainly used when we are interested in determining the frequency of a behavior, i.e. mand data (number of verbal requests) is collected as a tally of I and P over a time period (min) and then calculated as a ratio of independent and prompted mands (requests) per minute. When collecting data on behaviours that you want to decrease, the most common form used in schools is referred to as ABC data or charts. When using ABC charts, staff are trying to determine what the antecedents (A) are before the behaviour (B) occurs and what the consequences (C) are after the behaviour occurs. Collecting this type of data is useful for determining the function of the behaviour. Once the function of the behaviour has been determined, then an appropriate plan can be developed to reduce or extinguish the behaviour. Typically, data collection for a DTT trial is done after each trial. As the student is contacting their reinforcement, the teacher is writing down how the child performed at the task. The type of data sheet used can range from very simple to complex. It can be checkmarks, a plus/minus system, self graphing, etc. The method of data collection isn’t as important as making sure data is collected. It will be difficult to impossible to determine progress and make programming decisions without solid, accurate data. In my classroom, we take trial by trial data during DTT sessions. We use a simple plus/minus data system based on this data sheet from from Christine Reeve's Book, Taming the Data Monster. These data sheets contain all of the information needed for the instructor to run the program, take the data and graph it all on one sheet. You can also customize them to meet your specific needs. There is one data sheet for each goal the student is being taught, so if your student has a lot of goals, you could end up with a big binder of data sheets. While I like this format, it is challenging to flip through the data sheets to find the goal you want during a session, if your binder is not well organized. 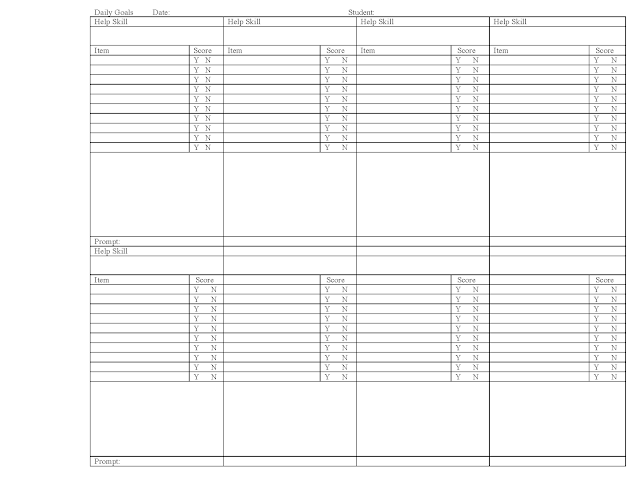 Another type of data sheet that I have used in the past contains numerous goals or programs on one page. The positive aspect of this type of data sheet is that you aren't flipping through a series of pages while trying to collect data and it's an easily portable system. 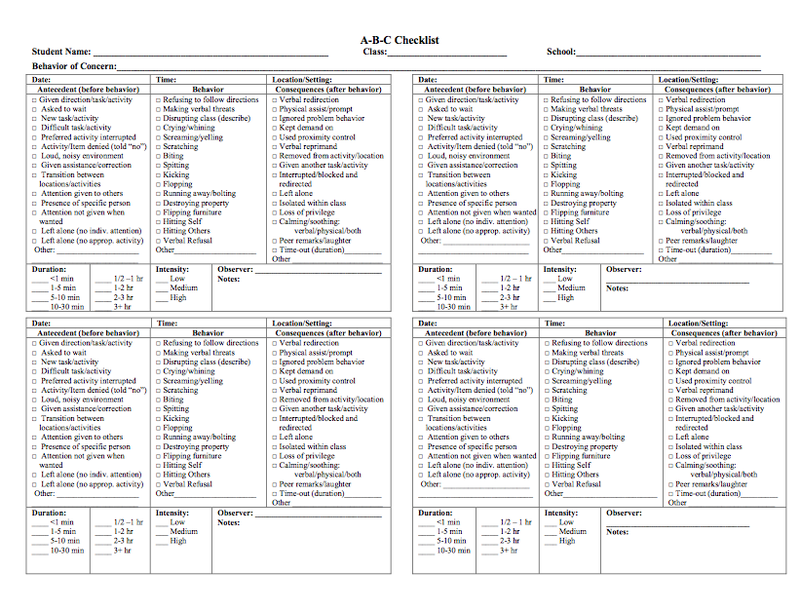 The downside of this data sheet is that you can't include a lot of important teaching instructions for your EAs/aides, so you need to write a separate teaching instruction sheet for each goal/program. The other negative aspect of this sheet is that you also have to graph data on a separate sheet, so you end up with an even bigger binder full of teaching sheets, data sheets and graphs. I also found this system to be more time consuming to write the programs and organize. As a Senior Therapist in an ABA program I had time built into my schedule to do this, but as a SPED teacher, I don't have enough prep time to set this up! If you don’t like data collection or want to avoid taking so much data, I’d suggest collecting first trial data. 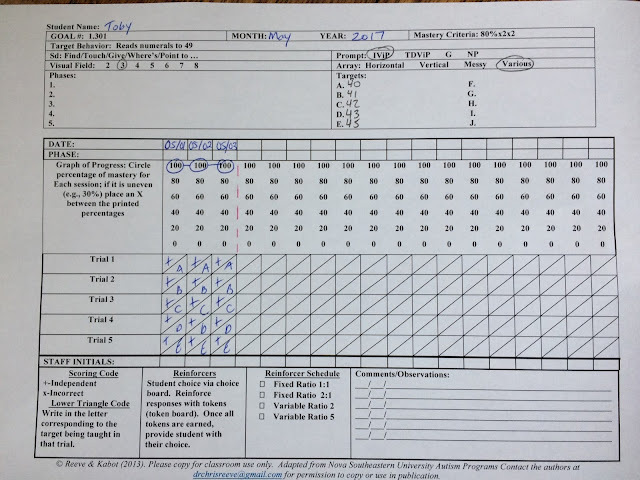 First trial data or “cold probe” data collection method involves collecting data only on the first trial conducted for each of the student’s goals/programs. The idea is that the first trial is a good test of how the student is doing because it follows a period of no practice and absence of receiving feedback on performance. All decisions about whether the student has mastered skills and has maintained this mastery over time are made based on first trial data. The research results on this type of data collection are mixed. While there are definite positives to collecting less data, i.e. more time is spent instructing and engaging with the student, having only one data point often doesn't accurately measure progress or pinpoint where the student is struggling. 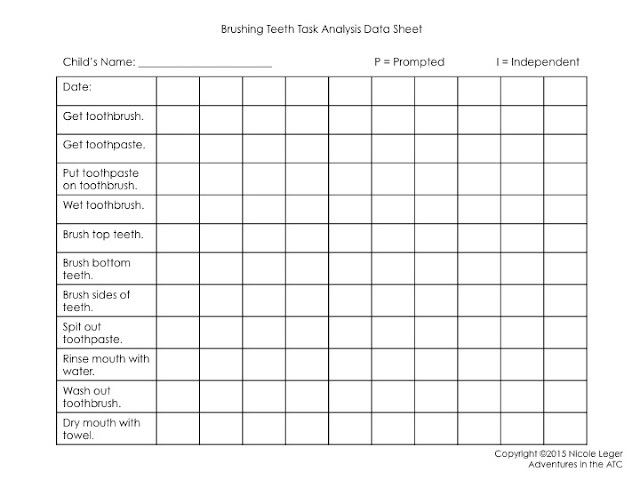 I rarely use this type of data collection in my classroom as most of my students are severely impaired. If I have a student, however, who has demonstrated rapid progress, I will switch to this method so that we keep up with the rate of learning and avoid the student getting bored by remaining on the same skill for too long. Take data on skills/behavior as it happens (or as soon afterward as possible). I had one EA in my room who never took data as she was presenting trials. She would record the data when the DTT session was finished, saying that she could remember how the student did on each trial. After her first week in my classroom of recording data in this manner, I decided to do some IOA (inter-observer agreement) recording with her. When we compared our data, it looked completely different. She had not remembered how the student responded on several trials and her data was not accurate or reliable. People tend to remember what fits with what they think is happening--so if you think Toby is getting better at manding, you are likely to remember the times he manded instead of the times he didn't, but should have. Your system of data collection should be easy to use and portable. To take data as it happens across the day and across environments, you need a data collection system that is easy to understand by all staff, can be easily transported, and allows staff to quickly record data without interfering with teaching. For DTT sessions in my classroom, we use the data sheets referenced above which are kept in binders and housed in our DTT area and therefore easily accessible. For data collection during other times of the day, we either have clipboards or binders with the data sheets we need in each area of the room. 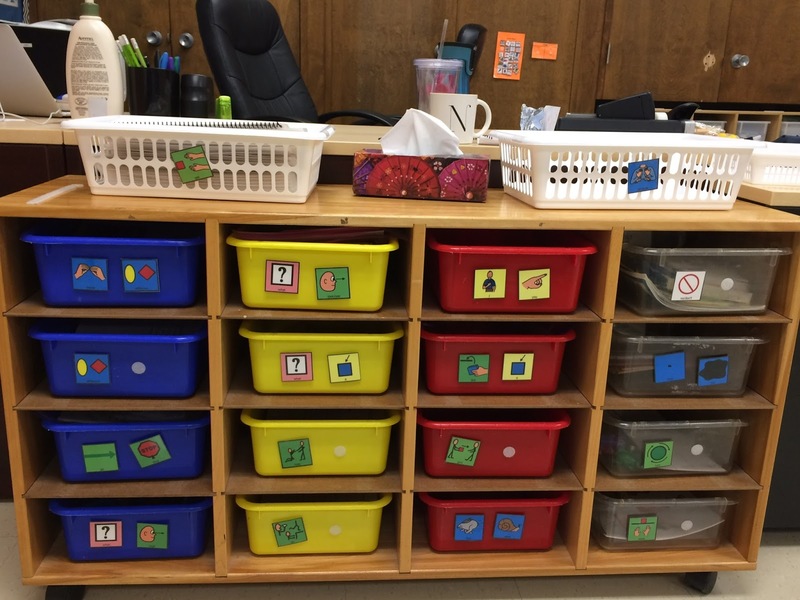 During math and literacy centres, we have binders with all of the students data sheets in the teacher bin. So, during rotations, whoever is at that table collects the data for each student. During our morning meeting and other whole class lessons, one staff is assigned to collect the data on all of the students during that activity. For personal care skills such as toileting or brushing teeth, a clipboard is kept in the washroom and data is recorded by the staff member with that student at the time. Research shows that teachers who graph their data and review it weekly have students who perform better. 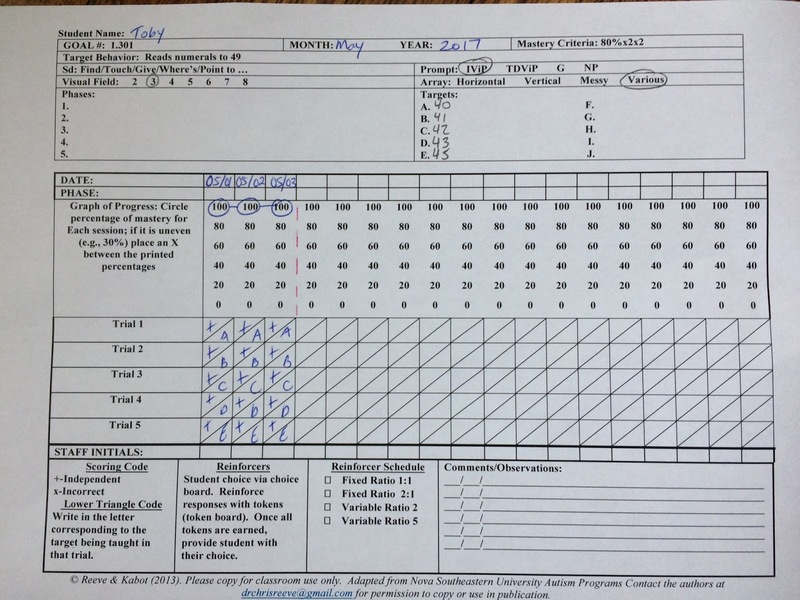 Data is taken to measure progress, and our students are constantly making progress! Analyzing the data you have collected on your students on a weekly basis allows you to pinpoint where your students are making progress, how quickly they are progressing, and where they are struggling. 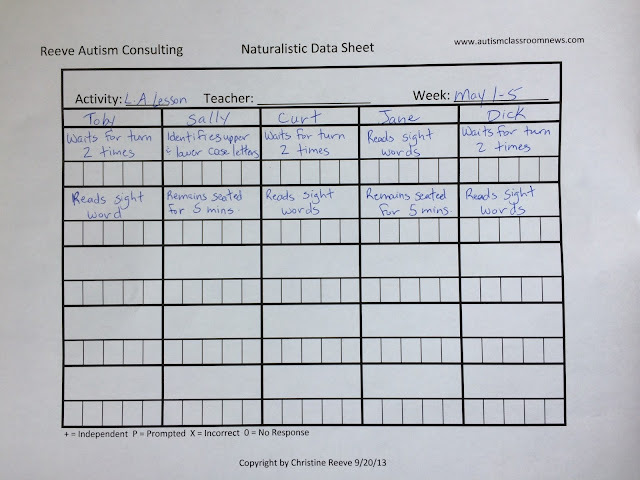 Weekly review of your data also allows you to ensure that your students are not getting bored by staying on the same skill or step of a skill for too long. In my classroom, we are fortunate enough to have every Wednesday afternoon without students. Every Wednesday afternoon, we sit down together and go through all of the student's data binders, program by program, to make any revisions we need to encourage faster mastery, reduce prompt levels, and choose new targets or skills. This habit of reviewing the data weekly ensures that we are teaching our students to progress and moving them forward in their learning. How do you take data in your classroom? What system(s) do you use? What do you struggle with the most? I'd love to hear from you! Drop a comment below! Thanks for stopping by! Today is the day I start setting up my classroom for the new school year! It's a bittersweet day for me as it signals the end of my summer days of relaxation and rest, but the beginning of a new adventure with my littles! Today I am setting up my classroom furniture and all of the visual supports. Then I will start prepping for the first two weeks. I have been teaching in the same classroom for 9 years now and I am not at all stressed about figuring out schedules or delivering curriculum because I know that's not what the first two weeks are about. I know what you are thinking; no schedules, no curriculum, are you crazy?!? I may be a little bit crazy, but trust me I know what I am doing! And I can help you to alleviate some stress by not over planning your first two weeks and still rock them! The key to success is to focus on 4 key areas: teaching rules and procedures, pairing with reinforcement, playing the contingency game, and conducting assessments. Many students with autism rely on rules and routines to keep their environment predictable and, therefore, feel safer. Educators must understand the importance of rules and routines for individuals with autism and apply them in various settings and situations. Application of rules and routines in school helps students with autism engage more successfully in activities and prevents problem behavior. Routines help create an efficient environment – they save time. When students know routines, they can perform daily activities more quickly. 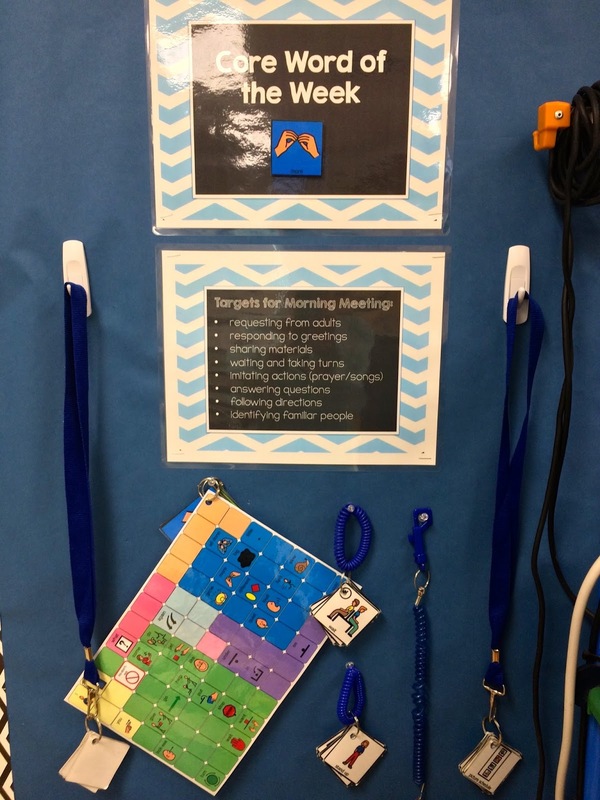 In my classroom, we use the first two weeks to really focus on teaching the students how to use the visual supports in the room to transition from one activity to the next, perform tasks independently and earn reinforcers. We also teach them the expectations for each activity of our day through practice and repetition. By taking extra time to do this at the beginning of the year, we avoid dealing with inappropriate behaviours or prompt dependency through the rest of the school year. Pairing yourself and your EAs/Paras with reinforcement is the best way to start the school year with your students. Pairing is a common term that ABA professionals often use to describe the process of building or maintaining rapport with a student. Teaching often begins with intentional and thorough pairing, where it's ALL about what the student loves or enjoys and making that available to them on a non-contingent basis (jargon defined: for FREE). Basically, teaching students with Autism should start off with low demand, and high reward. The school year should begin with intentional pairing. Even if you already know the child, you shouldn’t immediately jump into presenting demands. Pairing is how teachers establish instructional control, build trust, connect themselves to reinforcement (eventually becoming a reinforcer), and get to know the child’s interests. Skipping the pairing process can cause problem behaviors to increase, kill instructional control, and impair the teacher-student relationship. The video below is a good demonstration of an educator pairing herself with reinforcement. Contingency is the relationship between two events, one being "contingent" or a consequence of the other event. In order to increase a desired behavior, the student needs to know that receiving reinforcement is directly related to the behavior, or "contingent" on the behavior. This relationship of contingency, is incredibly important to the success of a special education program. The success of establishing contingency requires quick reinforcement, clear communication and consistency. Students who don't receive immediate reinforcement, or are not clear about the relationship of contingency, will not be as successful as those students who clearly understand the relationship or contingency. Teaching students to understand this relationship is referred to as "playing the contingency game". While pairing themselves with reinforcement, the educational team can start to intersperse some demands, so that the reinforcement becomes contingent upon responding to the demand. This can be done throughout the day, including during play times, direct instruction, mealtimes, pays. ed. and recess. Before, special education teachers can start to deliver curriculum, they must know what skills their students need to be taught and at what level they need to be taught. The best way to identify these is to conduct an assessment based on the curriculum you use in your classroom. We use the first two weeks in the classroom to complete the Hawaii Early Learning Profile assessment for each of our students. To learn more about how to complete this assessment click here. But, basically, we complete the assessments through parent interview, observation and direct assessment. Since this is a lengthy assessment, it can take up to two weeks to complete it with new students. With returning students, it usually takes up to a week, as we already have a good understanding of their needs. Regardless of what curriculum you use, the first two weeks should be dedicated to completing assessments so that you have a basis on which to develop IEP goals. So, when I said that I didn't start the school year with a schedule, that was a bit of a fib. I have a schedule, but it includes a lot of play time so we can work on pairing with reinforcement and establishing instructional control through the use of the contingency game. We work on a lot of maintenance tasks the first few days, so we have lots of opportunities for low demand/high reward situations. I plan fun arts and crafts activities, sensory/science experiments and gross motor fun to get the kids engaged and having fun. So, there you have it! My first two weeks in a nutshell! I'd love to hear from you about what you do during your first two weeks of school. Leave me a comment below! Thanks for stopping by! Communication deficits are one of the core symptoms of Autism Spectrum Disorders (ASD). People with ASD can be slow to begin talking, or may not learn to talk at all; others may learn to produce words and sentences but have difficulty using them effectively to accomplish social interactive goals. Because communication is so important, everyone who works with the student has to know how to teach these skills. There is not one single way to do this. Instead there are many interventions that educators can use to teach communication skills to students with ASD. Communication not only encompasses expressive language skills; how we really information to others. It also includes receptive language skills; understanding a message another person is trying to convey. In most students with Autism, both receptive and expressive language skills are delayed. Therefore, it is important to focus teaching on both aspects of communication. Just like all other skills, the communication skills we teach will be individualized to meet the unique needs to the student. To determine which skills to teach, you should consult with your school's Speech and Language Pathologist and also complete an assessment, such as the ABLLS-R, VB-MAPP or HELP. Once you have completed the assessment and consulted with your SLP, you can choose developmentally appropriate goals for your students. When teaching communication, we know what we teach will vary from student to student. However, communication is much more complicated. The method or mode that the student uses to communicate will vary too. In my classroom, we a variety of modalities based on each student's unique needs. 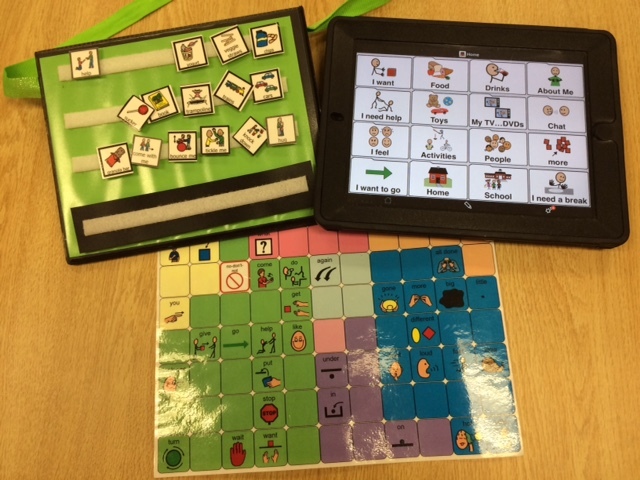 We use vocal language, PECS, ASL, Core Boards and iPads with Prologue 2 Go on them. We want communication to be enjoyable and meaningful for the student with ASD and using an appropriate system for the student is one of the first steps. If the student does not talk, then the educational team will determine the mode of communication to teach the student. Sometimes a student will have only one mode they are learning. For example, Amy is working only on learning sign language. Other students may have more than one mode. For example, Conner uses both words and pictures to communicate. Once the mode of communication is chosen, all staff in the classroom should receive training on it, if necessary. It is important that all staff are consistent in how they are using that mode of communication with the student. For example, there are specific phases in the PECS protocol that need to be followed when teaching a student to use that system. There are also variations in signs in ASL and it can be confusing for a student if staff aren't using the same sign for one word. Just as with any other kind of instruction we have to individualize how we teach communication skills to each student. There are two main teaching methods I use in my classroom when teaching communication skills. The first method is often referred to as didactic. A large body of research has demonstrated that didactic approaches are an effective means of initially developing attention to and understanding of language, as well as initiating speech production in preverbal children with ASD. Discrete Trial Instruction (DTI) entails dividing the chosen skill into components and training each component individually, using highly structured, drill-like procedures. Intensive training utilizes shaping, prompting, prompt fading, and reinforcement strategies. Trials continue until the child produces the target response with minimal prompting; at which point the next step in the hierarchy of behaviors (such as correctly pointing to the named picture from among two pictures) is presented and trained. The second method is called developmental or pragmatic. This approach emphasizes functional communication, rather than speech, as a goal. As such, teachers encourage the development of multiple aspects of communication, such as the use of gestures, gaze, affect, and vocalization, and hold these behaviors to be necessary precursors to speech production. Activities provide multiple opportunities and temptations to communicate; the teacher responds to any student initiation by providing rewarding activities. Thus the student directs the interaction and chooses the topics and materials from among a range that the adult provides. Teachers strive to create an affectively positive environment by following the student’s lead, and react supportively to any behavior that can be interpreted as communicative (even if it was not intended in that way). Anytime there is a natural opportunity to work on a communication skill, grab it! Learning new communication skills will be challenging for the student. It is important that we pay attention and respond to all attempts of communication by the student. This is especially important when the communication is appropriate! Let’s look at an example. Madison is just learning to request. Because talking is new to her, the words are not always clear. She says “coo-ee”. The teacher is thrilled that Madison tried to say the word “cookie” and gives her a bite. Responding to all attempts to communicate really requires us to pay close attention! Sometimes the student’s desire to communicate will be obvious. For example, Emily screams and reaches towards the snack shelf. It is obvious that Emily is “communicating” that she wants something to eat. Sometimes, however, the student’s attempt to communicate will be more subtle. Let’s look at Luke. He will often walk up to the teacher and stand beside him. He says nothing. In this example, Luke wants to communicate, but does not know how. It is our job to figure out what he wants and to help him. You must therefore take the lead and ask Luke if he needs something or ask him to show you what he wants. In addition to taking advantage of times that naturally pop up during the school day, you will also need to create times for the student to work on communication. This can be done in several different ways. Sometimes it might be done while working alone with the student at the table. For example, Alex is working on talking with appropriate grammar. During the day you might sit down with Alex and spend several minutes having a conversation, while helping him to use good grammar. Other ways you might teach communication throughout the day is to “set up situations” by manipulating the environment or materials. 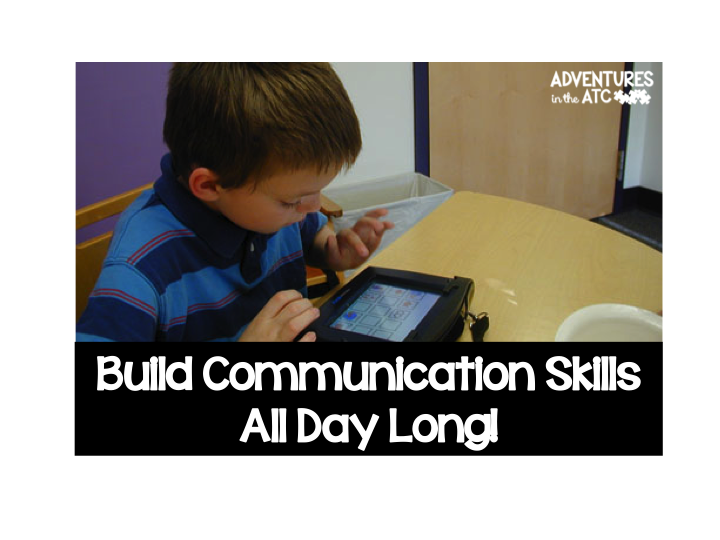 As you work with students with ASD, this will become one of the best ways you can teach communication during the school day. Manipulating the environment simply means you structure it in such a way that it fosters communication. In my classroom, we have child safety locks on all of the cupboard doors, so that students have to request to open the door and retrieve a desired toy or edible. We also lock the door to the bathroom, to work on requesting to use the washroom. During art class, we withhold needed supplies so that the students have to request what they need and we also teach them to ask for the colour they want to use as well. When I make my class schedule, I identify when we will work on different skills and post this in each area of the classroom. For example, during our morning meeting we work on greetings, answering questions, and requesting to have a turn. During direct instruction times (DTT sessions), we use didactic teaching methods to work on receptive and expressive language skills, as outlined in the student's IEP. Examples of these skills include identifying and tacting noun objects, action words, adjectives, prepositions, etc., echoics (vocal imitation), manding (requesting) and intraverbals (filling in blanks, answering questions). During free play and floortime sessions, we use developmental or pragmatic methods to work on communication skills. Provide praise and reinforcement anytime the student uses an appropriate communication skill or tries to use the skill. Prompt the student to help him or her learn to use the new skill. How do you incorporate teaching communication skills into your day? I'd love to hear from you! Leave a comment or shoot me an email! Thanks for stopping by! Everything You Need To Know About a Calm Down Kit! Copyright Adventures in the ATC: 2015. Powered by Blogger.